Do you like crocheting items for babies and toddlers? 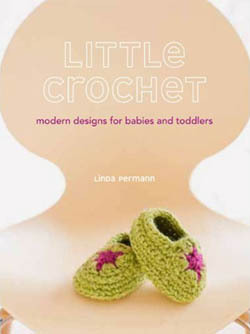 If so, you might be interested in Little Crochet: Modern Designs for Babies and Toddlers by Linda Permann! In this review I’ll let you know what I personally think of the book (the good and the not so good), to help you figure out if this book is right for you. Most books (at least the good ones) do a job at covering the crochet basics before jumping into the patterns, and Little Crochet is no exception. In the “Before you Begin” section, you’ll see basic information on hooks and yarn to more important information about baby sizing and reading symbol diagrams and schematics. You can skip this section if you’re a seasoned crocheter, but it never hurts to browser through it. For the beginners, I would definitely recommend reading over this section before starting the patterns, as it’ll probably answer questions you may have as you crochet. There are 24 patterns for baby and toddler items. Unlike other books, Little Crochet contains a wide range of patterns: clothing, blankets, bibs, beanies, booties, washcloths, toys, and much more. The patterns are geared towards boys and girls. In the “Little Clothes” section, there’s an almost even boy to girl patterns ratio, with a little more girly patterns. Most of the boy patterns can also be made for girls. Feel free to visit Little Crochet’s Amazon.com page where there’s a neat video of some of the finished pieces. Don’t forget to enlarge the video so you can actually see it! There is also a feature to look inside the book, so you can see the first few pages. These patterns are easy to follow for anyone who knows the basics of crochet and how to read crochet patterns. If you’re new to crochet, it might be a little trickier for you, but reading the “Before you Begin” section and the appendix for tutorials should help. The patterns are primarily easy and intermediate level patterns with a few experienced level patterns throw in. There aren’t any beginner patterns, so I wouldn’t recommend this book to first time crocheters (unless you’re really determined and persistent in working the patterns). If you’re not sure what skill level you are, feel free to learn more about skill levels on the Skill Level Symbols for Crochet Patterns post. Aside from the patterns being clear to read, I should point out that there is a symbol diagram for every single pattern in the book! A huge plus! For those who aren’t familiar with symbol diagrams, these help to visualize the work as you crochet. Sometimes symbol diagrams are much easier to read than the written pattern instructions. In this book they are used as a visual reference to aid you as you read the written instructions. Not one book is right for everyone. In my opinion, Little Crochet is probably not good for first time crocheters since it doesn’t have beginner level patterns. First time crocheters are better off with a “how-to” book (or you can start with the How to Crochet post) before starting this book. If you know the basics of crochet, you can probably do the lower skill level patterns in this book and learn new techniques as you go. It’s always great to challenge yourself, this book would be good for that! For the more experienced crocheters, this book will be a breeze to understand, so as long as you love the look of the patterns, you’ll love working with this book. Often times I hear people say that pattern books aren’t worth buying because they only like 1 or 2 patterns in it. So don’t forget to check out Little Crochet’s Amazon.com page so you can see the different patterns for yourself! If you’ve purchased this book, feel free to share you’re opinion on it in the comments below! Help others decide if this book is right for them. This entry was posted on Wednesday, April 6th, 2011 at 1:17 PM by Rachel Choi	and is filed under News. You can follow any responses to this entry through the RSS 2.0 feed. You can leave a response, or trackback from your own site. I have several of this books patterns queued in my ravelry queue waiting for me to buy this book. I haven’t seen a book where I want to make so many projects from it in a long time, if ever. For someone with a baby who loves to crochet it would be an excellent purchase. The projects are SO cute! Gotta love an honest review! I agree it’s hard to find a book with a bunch of patterns ya love. After watching that video on amazon, I think I’ll give this one a try. I’ll let you know how it goes when I get it and start working on them. This might be just the ticket for my baby niece, might buy it!! I wish we would get more crochet pattern books for children ages 6-14, especially for boys. The selection of patterns is so minimal for this age/size range. I don’t know that I need another book of patterns for babies and toddlers, especially if it’s predominantly for girls. I’m actually working on the Sweet Daisy Sundress that was published in a crochet magazine recently. And let me tell you how absolutely adorable it is. It’s easy to follow and the design is clean and simple. I will be buying this book. Such a cute book! I think I would just sit down and crochet my way through it. The birdie mobile is exactly what I was looking for when I had my first baby! I like the ball better than my current pattern and MUST make the owl! What a fun giveaway! I will probably get this book eventually. Thanks for introducing me to it. I would have to say the ball then the capeand oh heck everything in the book!